The Ruins of Richmond | Cover Story | Style Weekly - Richmond, VA local news, arts, and events. A closer look at seven pieces of potential across the city. 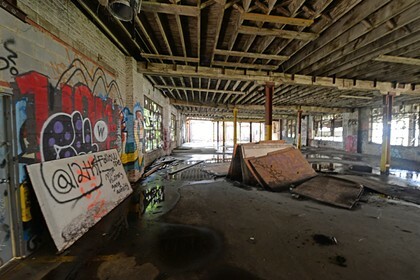 Scott Elmquist Graffiti softens the interior and exterior of a former paperboard plant next to the Manchester Canal. Construction fences recently were dismantled downtown from the renovation of the long-vacant Central National Bank on East Broad Street and the Ninth Street Office building on Capitol Square. Two looming relics of the past were resuscitated. 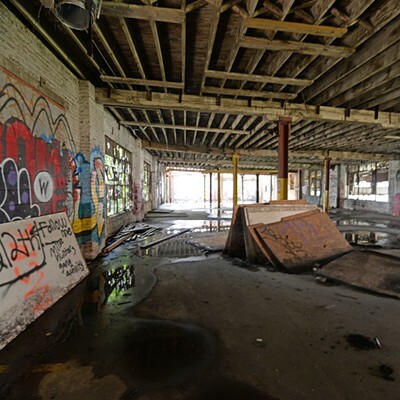 In other neighborhoods, by re-purposing frayed structures — from eateries on East Grace Street to former warehouses and factories turned ultra-modern residences in Manchester and Scott’s Addition — the city is quickly losing the tarnished patina that once defined its streetscapes. So as Richmond adjusts to its decidedly brighter and cheerier architectural face, the decreasing number of intriguingly ruinous sites become all the more portentous and picturesque. The Manchester Canal, now an abbreviated and swamplike waterway that was built by black and Irish laborers, was envisioned as a navigation connection to the west. While the James River and Kanawha Canal took on that task on the north side of the river, this canal served paper mills in the vicinity of the Mayo Bridge. 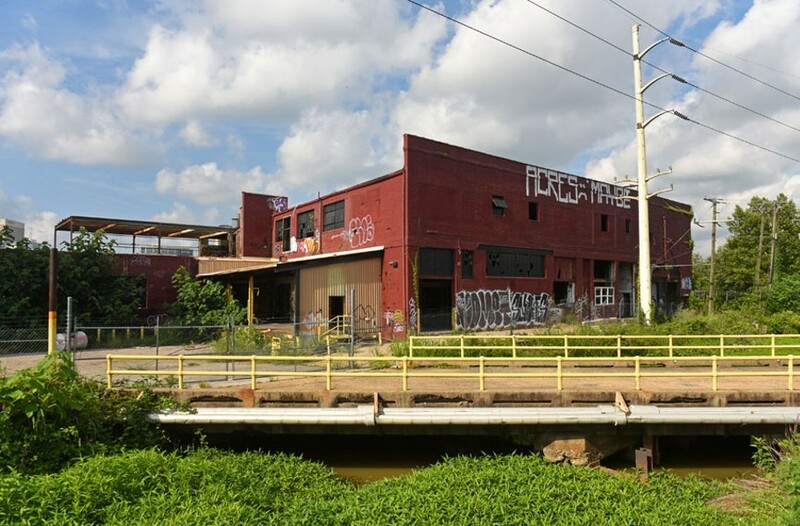 Today, the skeletal Richmond Paper Board factory, built in 1929, offers a picturesque silhouette for joggers and hikers moving atop the flood wall. But enjoy the view soon. 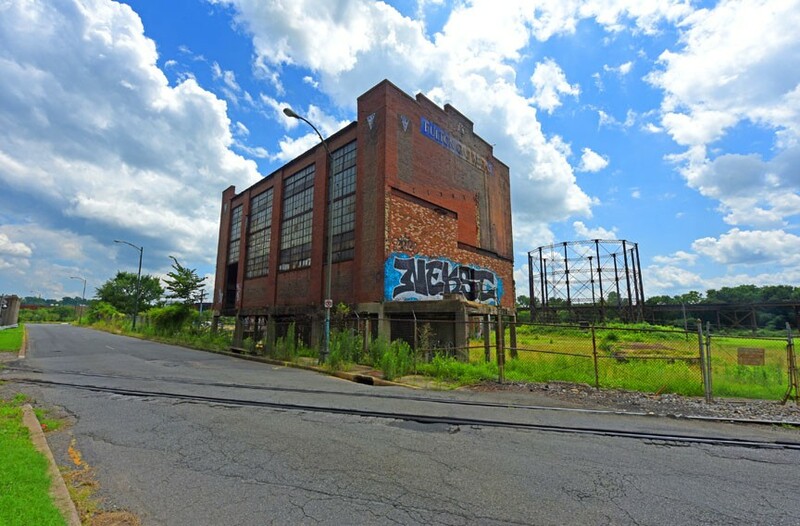 This ruin awaits demolition for a high-rise apartment complex scheduled on the 2-acre site. Some 200 units comprise the first phase. 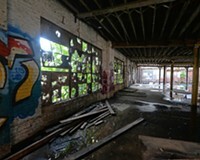 Awaiting renovation, the Vepco hydro station on Brown’s Island has been stabilized and become a de facto mural gallery. 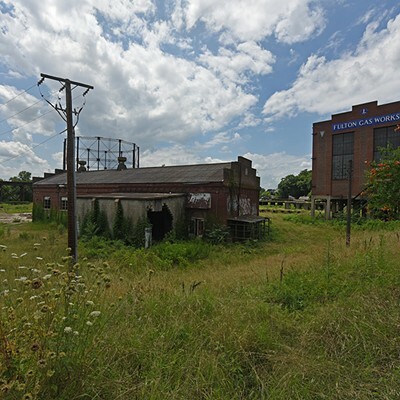 Among the most elegant of Richmond’s vestiges of industrial-age architecture are the remains of the former Vepco hydroelectric plant at the eastern end of Brown’s Island. It looms like a dinosaur adjacent to sparkling new high-rises and well-executed rehabilitations of former industrial buildings. This concrete and stucco structure, with classical Doric detailing, also serves as a connection point between the Haxall millrace to the north and the James River to the south. 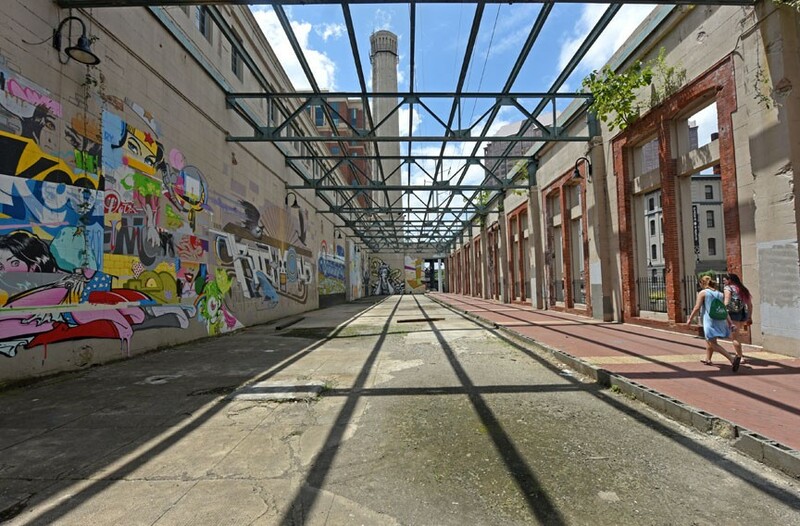 Cordish Co. of Baltimore owns the site, which has become an open-air, pass-through gallery of murals. It awaits redevelopment. 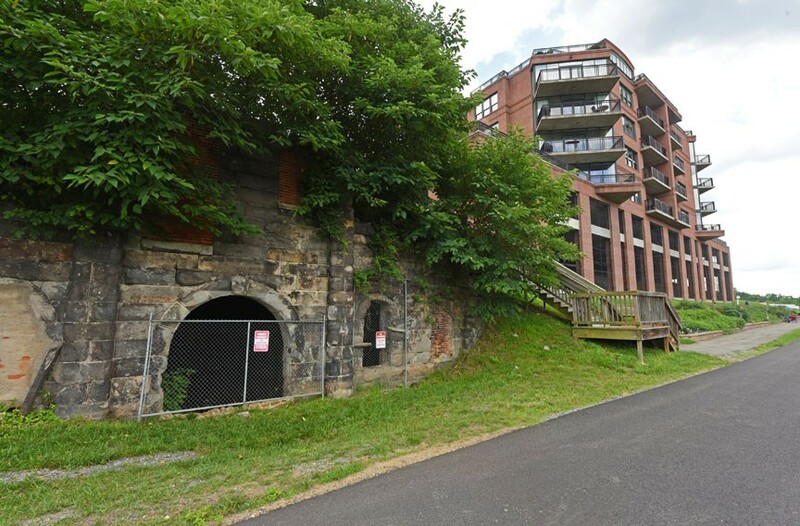 The old Yuengling beer caves face the Capital Trail. Where: 4920 Old Main St.
With housing, restaurants and now Stone Brewing Co., redevelopment in the East End continues to evolve, injecting life into a district once left behind with the demolition of the Fulton Bottom neighborhood and the region’s ever-westward growth. Elements that remain, and offer silent testimony to the past, are the abandoned beer caves at Rocketts Landing. The stone arches and retaining-wall facade are as close as you get in these parts to evoking the ruins of ancient Rome. Now overlooking the Capital Trail and all but obscured by spiffy office buildings and residences at Rocketts Landing, these brick-vaulted caves are what’s left of the former James River Steam Brewery. It was established in 1868 by D.G. Yuengling Jr., whose father founded D.G. Yuengling and Son, which still operates in Pottsville, Pennsylvania. The James River brewery originally used steam power that was generated in the equivalent of an eight-story building that rose above ground. The caves could store as many as 6,000 barrels of beer. And from this waterfront location, the brew was easily transferable for shipping by trains or boats. But with advances in refrigeration in the late 19th century, the caves became outmoded. The caves can and probably will be stabilized and restored, but the plant roots of heavy overgrowth continue to invade this evocative ruin. 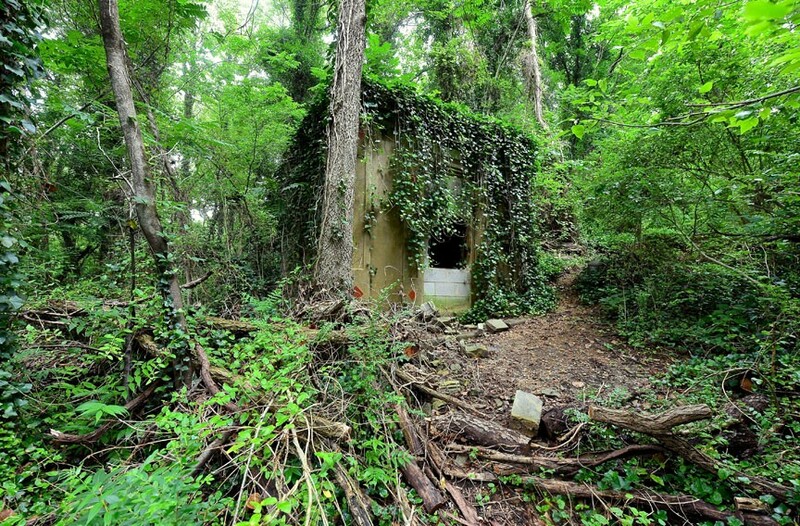 The Braxton family mausoleum, obscured by tangled overgrowth like most grave sites in Evergreen Cemetery, also has been defiled by vandals. 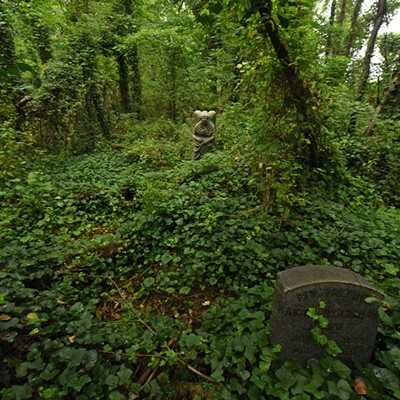 Historians and sociologists can debate why many urban cemeteries fall into decay. 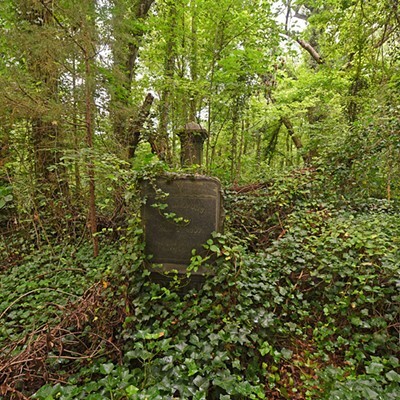 But this is certain: Some of Richmond’s black cemeteries are ruinous and embarrassing disaster zones. Even the most disinterested observer will ask why. 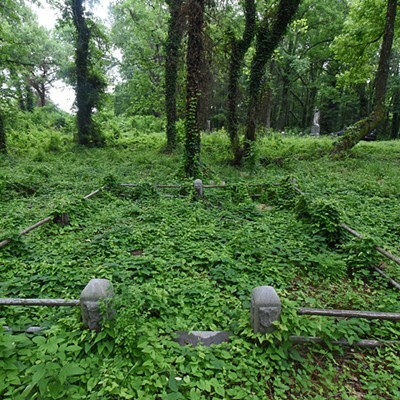 The most far gone of these graveyards is Evergreen Cemetery, which occupies some 75 acres along with the East End Cemetery on Stony Run Road. 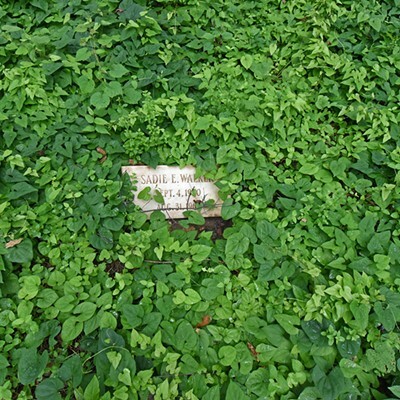 Established in 1891 on a ridge that runs above Gillie’s Creek, the hill is now indiscernible with dense forest, weedy undergrowth and kudzu obscuring most of the 5,000 graves and tombstones. Among the prominent players of the early-20th century Richmond buried here are businesswoman and civic leader Maggie Walker as well as John Mitchell, impassioned editor of the Richmond Planet newspaper. 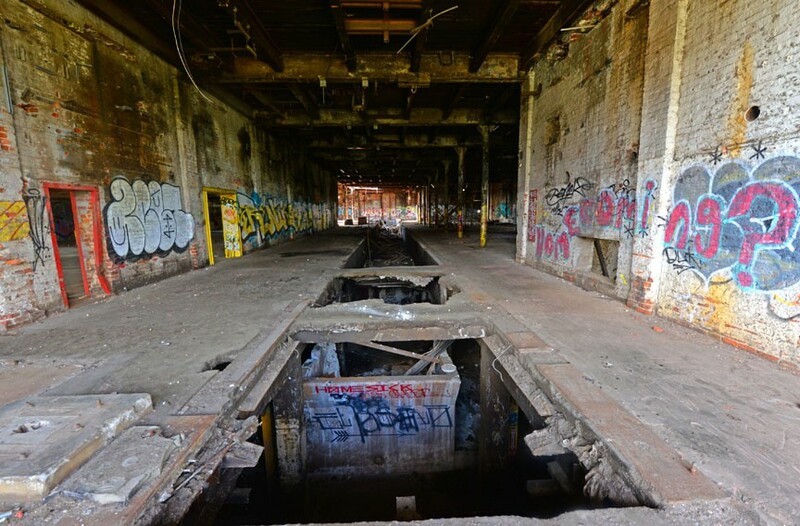 Vacant for 44 years, the Fulton Gas Works is a collection of brick and metal industrial structures. The sprawling Fulton Gas Works was established in the mid-19th century to convert coal to gas for heating and lighting, especially for city street lights. A tar byproduct of the conversion process was used to seal the hulls of ships. During the Civil War, when white workers were called to military service, slave laborers toiled here. By 1950 the City of Richmond was converting its customers to natural gas, and in 1972 damage from Hurricane Agnes forced the plant’s closing. 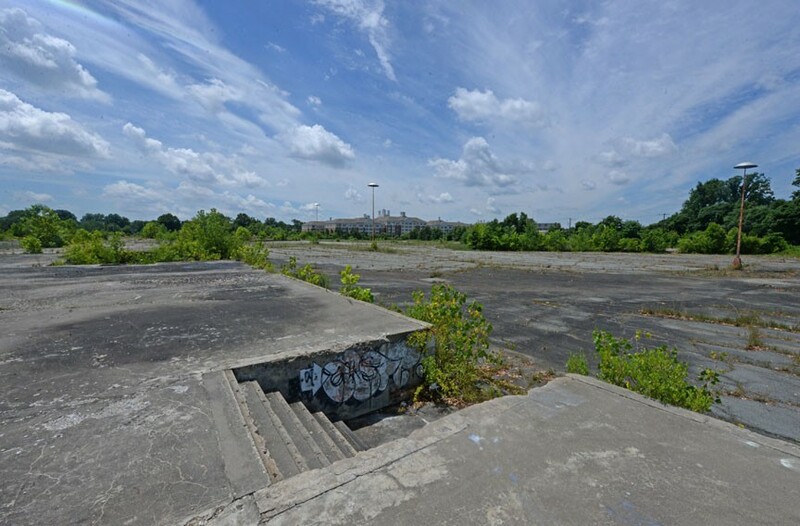 The coal-to-gas conversion process created an extremely toxic byproduct that permeates this East End site, making it an industrial brown field. But that environmental issue doesn’t detract from this being a glorious ruin. Slabs of concrete are all that remain of Azalea Bowl on Brook Road. In the distance is the Westminster Canterbury Richmond retirement community. 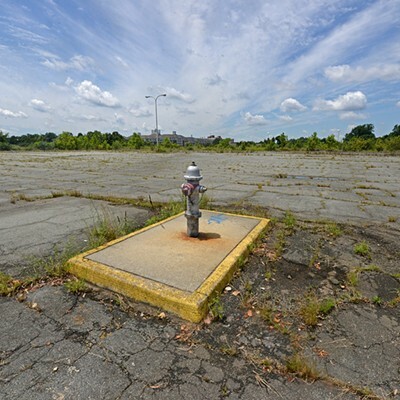 Azalea Mall opened as Richmond’s first enclosed mall in 1963, in the exuberant but waning days of America’s age of innocence, before President John F. Kennedy was shot dead and the conflict Vietnam began intensifying. While there was something futuristic about the festive interior fountain and shopping in air-conditioned comfort, customers enjoyed a solid middle-class shopping experience with national retailers such as Woolworths, Thom McCann, Food Fair and the Home Shop. There also were such local staples as LaVogue, Rees Jewelers and a Thalhimers department store. And if the Americans had sent a troop of monkeys into space by 1963, no trip to Azalea Mall was complete without visiting the Hofheimer’s shoe store, where a monkey twosome, Peaches and Cream, resided in a glass cage. The mall was closed in 1995 and razed in 1998. Little remains except acres of asphalt parking lot and the terrazzo flooring of Azalea Bowl, which occupied its own building behind the shopping center. That fractured space was recently claimed by skateboarders, but now, even they are gone. And what became of Peaches and Cream? Reportedly, they were resettled at Kings Dominion. 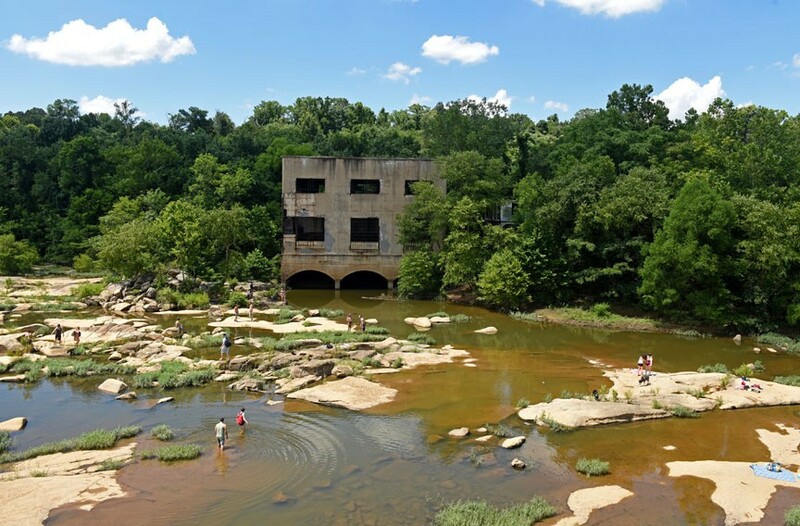 A former hydroelectric plant on the eastern end of Belle Isle rises from a popular swimming hole. Few visitors would confuse Belle Isle with such swimming destinations as the Venetian Pool in Coral Gables, Florida. 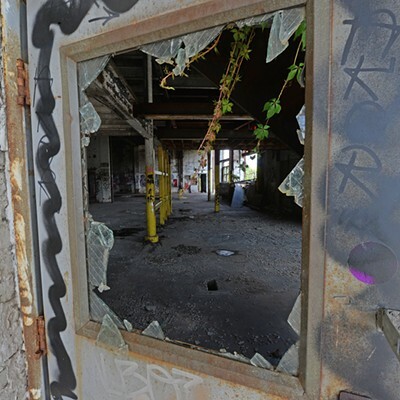 But that doesn’t mean hundreds of youngsters aren’t attracted to the disintegrating window openings and inspired to jump from three levels into waters below. 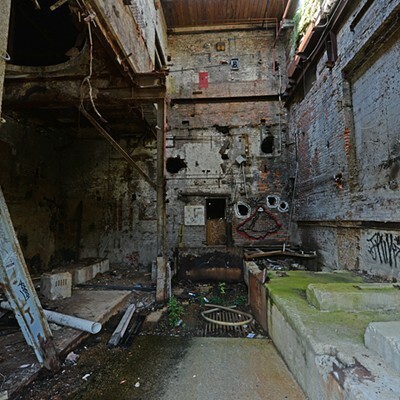 The boxy, concrete structure is but one part of a complex system, built by the Upper Appomattox Co., which once powered Manchester’s electric street car system. River water was shot through metal grates and then turbines. While water spun the blades, drive shafts turned the generators that were installed in the concrete building to produce electricity. Virginia Electric Power Co., now Dominion, acquired the plant in 1925. But over time, silt eroded the blades, debris clogged the grates and during summer months, constant water flow wasn’t assured. In 1963 the plant was decommissioned and the generators shipped to Peru where they still may be operational. And a word of advice to would-be Greg Louganises: Jump, don’t dive. Tall oak trees appear to dislodge the brick front of a former retail showroom turned into a church. Formerly a Best Products catalog showroom. OK, give us this one. West End Presbyterian Church is far from a ruin. Its sizable and dynamic congregation fills the contemporary spaces once occupied by a Best Products catalog showroom with worshipful praise and music on Sunday mornings and at other times. But it is a ruin, and intentionally so. When completed in 1980, the structure joined half a dozen other Best showrooms designed by Sculpture in the Environment, known as S.I.T.E., a New York architecture and design firm that challenged existing precepts about how a suburban big-box store should communicate. Best’s founders, husband and wife Sydney and Frances Lewis, had collected sculptural artworks by S.I.T.E. principal James Wines, so it wasn’t a stretch for his firm create a collection of architecturally distinctive showrooms. On Quioccasin Road near Regency Square, the theme S.I.T.E. chose is nature’s revenge. 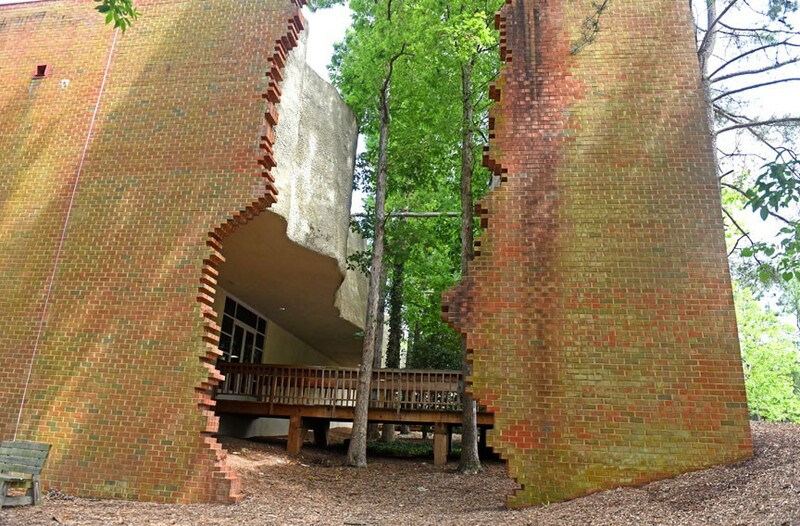 Large, existing oak trees and other foliage were left in place and appear to break through the core of the large, red brick structure. It was once a witty and cautionary tale as consumers purchased blenders, lawn mowers, golf clubs and television sets. Today, the irony is that a Presbyterian congregation’s stewardship now includes now maintaining a world-famous ruin — uh, building.